Anna University Chennai Today (12th June 2013) announced the Rank List for the Tamil nadu Engineering Admissions TNEA counselling. This year over 2 Lakhs Applications has been sold. Few days back the Random Number was Published. 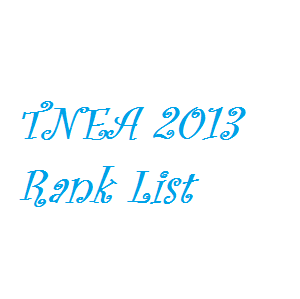 How to check your TNEA 2013 Rank? TNEA 2013 Rank for all candidates can be checked through online. To check online you need to enter your TNEA 2013 Application Number in the online page for which the link is provided below and if needed please enter your Date of Birth. Also it will be printed in the TNEA 2013 counselling call letter which will be mailed to you before the counselling. Where to Check your TNEA 2013 Rank? Enter your Application Number in the Application Number Box. Enter your date of Birth in the Date of birth box. Please give the correct details to get your rank.